“Soft Way to Mozart” is a curriculum that covers music education for all ages beginning from 24 months through elementary and on to secondary school levels. 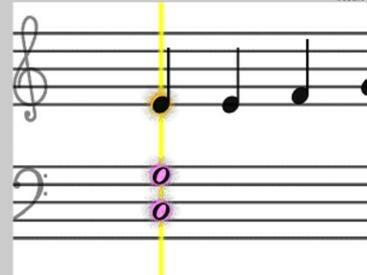 Gentle Piano™ – visual and interactive sheet music. 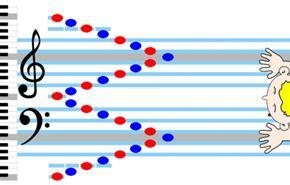 There are about 500+ piano pieces in the form of software. 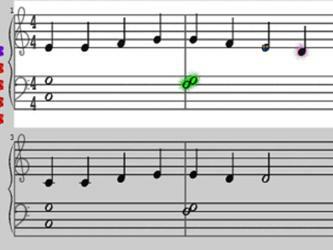 Instead of placing a piano book on a piano stand, music sight-readers see notation on the monitor. When they play the notes, they see feedback through different animation characters. 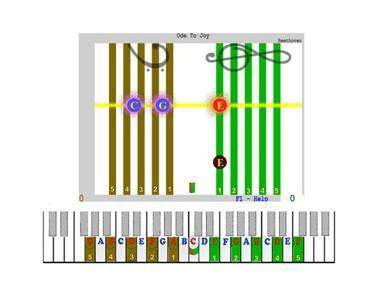 Soft Mozart™ software modules that teach music theory and provide ear training. 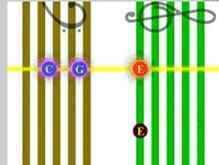 One module, for instance, teaches Note Duration, another Notes on the Treble Staff. There are a total of 6 such modules. You can find all the listed items in our store and buy them in downloadable and/or packaged versions with the CDs and materials. At this site, you'll find everything you need to start and continue your music education - whether a beginner, intermediate or advanced student (or even a piano teacher!). We have plenty of material. 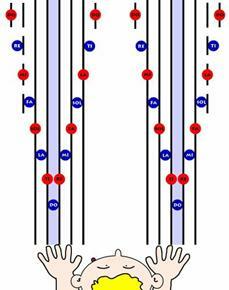 However, here is where you START – with the look at Grand Staff Visual Simplification. 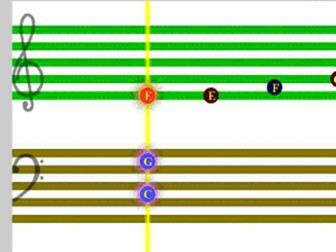 From this, you can see that the lines and spaces of the Grand Staff can be viewed in a straight, bold, natural and visual connection with their respective piano keys. This means no more drilling. We cut the corner in learning and save loads of time, energy and effort! Our curriculum covers all levels beginning from 24 months. We think that it's childish to simplify music notation and start with original music notes. 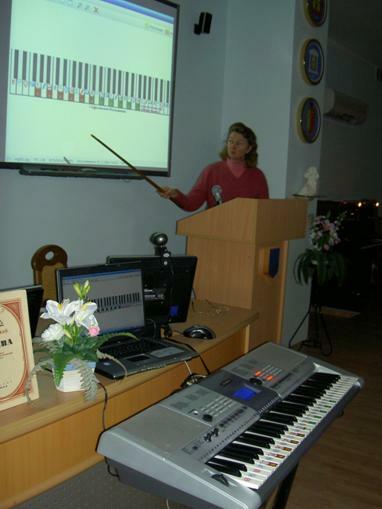 However, learning to play piano and read music at the same time is definitely “multitasking.” This is why our curriculum is designed to provide you with a healthy balance between technique developments and sight-reading challenges. The following images will give you an idea of some of our additional resources for the beginner. Our principle in all of this is very simply stated - Solve only one problem at a time. Pressing down a key with one finger. Even a two-year-old child has something that can be used! Our music curriculum contains graduated steps which all beginners can take. We build all your talents from scratch and guarantee the results - or your money back. Click here to buy our package to get started!